The Tutankhamun London exhibition includes information, housed in galleries, based on various themes including Egyptian Traditional Beliefs . Comprehensive facts and information on Egyptian Traditional Beliefs can be accessed by our sitemap. But this page details fast facts and info that we hope will 'wet your appetite' for Ancient Egyptian History and the Tutankhamun London Exhibition including Egyptian Traditional Beliefs . 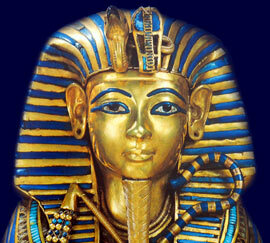 Fact 1 The religion of the Ancient Egyptians was extremely important to them and touched every aspect of their life. Fact 2 The religion of Ancient Egypt was a polytheistic religion (with many gods). Fact 3 The Ancient Egyptian Gods numbered nearly 2000. Fact 8 The Ennead is the collective name given to the nine original deities (Gods and Goddesses) of the cosmogony of Heliopolis (the birthplace of the Gods) in the creation myths and legends of the Ancient Egyptians. Fact 11 Egyptian Gods or Goddesses were often depicted as being part human and part animal. Fact 14 Animal Cults - The Egyptians believed that the Spirit of a God resided in specific animals leading to various animal cults in which these animals would be revered and worshipped as reincarnated Gods during their lifetimes. Each section of the King Tut website addresses all topics and provides interesting facts and information about the Golden Age of Pharaohs and of Egypt London Exhibition. The Sitemap provides full details of all of the information and facts provided about the fascinating subject of the Pharaoh Tutankhamun and the Egyptian Traditional Beliefs .